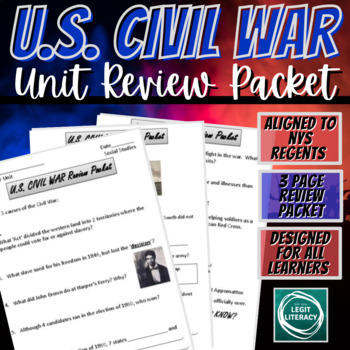 This product is a review packet meant for middle school students studying the American Civil War. It can be used for homework, but recommended for review in school. It's purpose is to promote deeper conversation on each of the concepts and topics provided in the document. Suggestion: In the past, students have collaborated and used the SMART board to fill in each of the sections. They would then discuss the term/person/event and fill in their own copy of the review packet. If purchased - a review of the product would be greatly appreciated! Thanks!